Berry Dive Center is proud to be recognized as one of the top repair facilities in the nation. Our unmatched service and repair department utilizes state-of-the-art testing equipment and the latest in specialty tools to keep your equipment functioning flawlessly. We use ONLY oxygen-compatible cleaning solutions and lubricants in our test facilities. Our award-winning technicians are certified by ALL of the top manufacturers. Our techs are highly trained in the service and repair of the latest technologies and in a wide variety of older models as well. Don't trust your life support equipment maintenance to anyone else! We are confident our quality and service will meet and exceed all of your expectations. 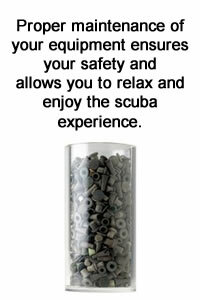 To help insure total satisfaction we invite you to use a FREE pool practice after your gear is finished being serviced. To set up your session, just call ahead and remember to bring in your certification card. 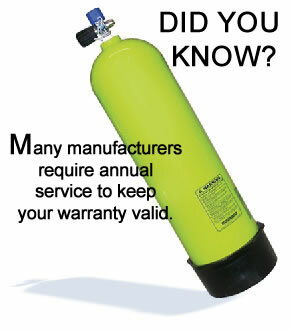 Family service savings - save when we service your whole family's gear!